Patrick Dorehill, who has died aged 94, was the second pilot of a Lancaster which carried out a daring daylight attack against the MAN diesel engine factory at Augsburg in southern Germany, earning him an immediate DFC and his captain the Victoria Cross. After a week of low-flying practice, 12 Lancasters, six each from Nos 44 and 97 Squadrons, took off during the afternoon of April 17 1942. Leading the first formation was 25-year-old Squadron Leader John Nettleton from South Africa. 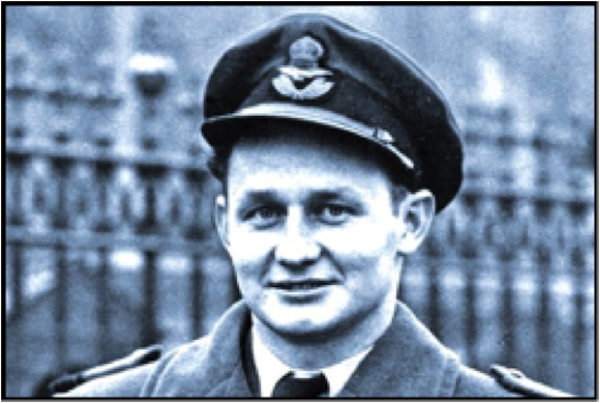 Pat Dorehill, a Rhodesian, aged 20, flew as Nettleton’s 2nd pilot; it was his 16th operation. The audacious raid, the first of its type flown by the RAF, involved a round trip of some 1,250 miles, mostly over enemy territory. The Lancasters flew over France at extremely low level while an RAF diversion force attempted to draw away enemy fighters. Nettleton’s formation strayed near a Luftwaffe airfield; the returning German fighters engaged the six Lancasters, four of which were shot down. Despite their aircraft being damaged, Nettleton decided to press on with the only other surviving aircraft of his formation. Over the target, flying at roof-top height, Nettleton and Dorehill met withering fire and the last member of their formation was shot down as it flew alongside them. Nettleton’s bombs hit the factory and they turned for home in the failing light. The second formation of six lost two aircraft over the target. Only five of the 12 Lancasters returned. In later years, Pat admitted that witnessing his colleagues crashing around him affected him, but his sense of duty took over and after three days’ leave he returned to train as a Lancaster captain. Nettleton was awarded the Victoria Cross and all his crew were decorated; Pat was awarded an immediate DFC. A year later, Nettleton was posted as missing in action on a raid to Italy. Patrick Arthur Dorehill was born on July 4 1921 at Fort Victoria, Southern Rhodesia, and educated at Michaelhouse School, Natal. At Rand University he studied Mining Engineering and briefly worked in coal mines before joining the RAF in July 1940 and training as a pilot. After joining 44 Squadron, Pat Dorehill flew his first operation on August 31 1941. Over the next few weeks he attacked German capital ships in Brest and dropped mines in the entrances of German-held ports. At the end of the year, the Squadron became the first to be equipped with the four-engine Lancaster, and Dorehill flew that aircraft for the first time on 6th January 1942. On the night of 3rd March, flying with Nettleton, he flew on the Lancaster’s first operation of the war, dropping mines in the seas around Heligoland. After the Augsburg raid, Pat was given his own Lancaster and crew and they attacked Bremen on the third ‘Thousand Bomber’ raid. They also attacked industrial cities in the Ruhr. After more than 30 operations he was rested and spent the next 18 months as an instructor at a heavy bomber training unit. Dorehill returned to No 44 (Rhodesia) Squadron in December 1943 just as the main phase of the Battle of Berlin commenced. This was at the height of Bomber Command’s strategic bombing offensive when losses were at their greatest. Pat attacked Berlin seven times. On one occasion he was approaching the ‘Big City’ when a fighter attacked his aircraft. Pat succeeded in evading his pursuer but his Lancaster had been repeatedly hit by cannon fire, which damaged the fuselage and the tail plane, and put the hydraulic system out of action. Despite this, he pressed on and dropped his bombs successfully. On his return to base he made a masterly crash landing. He was awarded a Bar to his DFC. Pat Dorehill attacked some of the most heavily defended targets in Germany and on 9th April flew his 60th and final operation, a raid on Danzig. In recognition of his outstanding service he was awarded the DSO. After a period as a bombing instructor, he trained on transport aircraft and in November 1944 was seconded to BOAC, operating from Whitchurch, near Bristol. On February 23 1945 he flew his first route, taking a Dakota to Castel Benito in Libya and on to Egypt. He relinquished his RAF commission in November 1945 on joining British European Airways (BEA), the beginning of a 31-year career with BEA and British Airways. He flew the Viking and the Viscount before transferring to jets: the Comet and the Trident. After a period as a training captain, he returned to route flying as a senior captain and retired in 1976. A keen golfer, Patrick Dorehill was a member of the Crowborough Beacon Club, where he twice achieved a hole-in-one, the second time when aged 91. Pat married Pauline Gamble in 1944 and she died in 1978. His second wife Dora also predeceased him. He is survived by his third wife Hazel and two sons and two daughters from his first marriage. Patrick Dorehill died on 7th June 2016. A service of thanksgiving was held at All Saints Church, Crowborough on 28th June 2016. Wing Commander Bob Horsley DFC AFC, bomber pilot, was born on May 4, 1921. He died on 19th January 2016, aged 94. As a bomber pilot who was forced to flee the Nazis in occupied France and later as an intelligence officer in the Middle East who had to vanish to escape the ire of the KGB, Bob Horsley was a man of many talents. Charming and urbane, he was never more in his element than when the chips were down. There was a moment during his weeks of evading the Nazis when Horsley, then en route to the Spanish border, was making his way out of Liège railway station with a younger member of his crew. His companion spotted two SS officers in their dark uniforms coming towards them and panicked, telling Horsley they should give themselves up immediately. The escapade started when Horsley, then aged 21, took off as part of the crew of an Avro 679 Manchester bomber from RAF Skellingthorpe in Lincolnshire in May 1942 on the first Thousand Bomber raid, which was over Cologne. The aircraft was in poor condition. Its captain, Leslie Manser, was forced to fly below its designated bombing height. Exposed to German flak, the plane took several hits. Manser decided not to bale out, but to try to make it back to England or, at worst, reach the Channel in the stricken plane. Eventually, at just 800 ft, he calmly ordered his crew to jump. They all parachuted out; for Manser it was too late and he went down with the plane. He was posthumously awarded the VC. 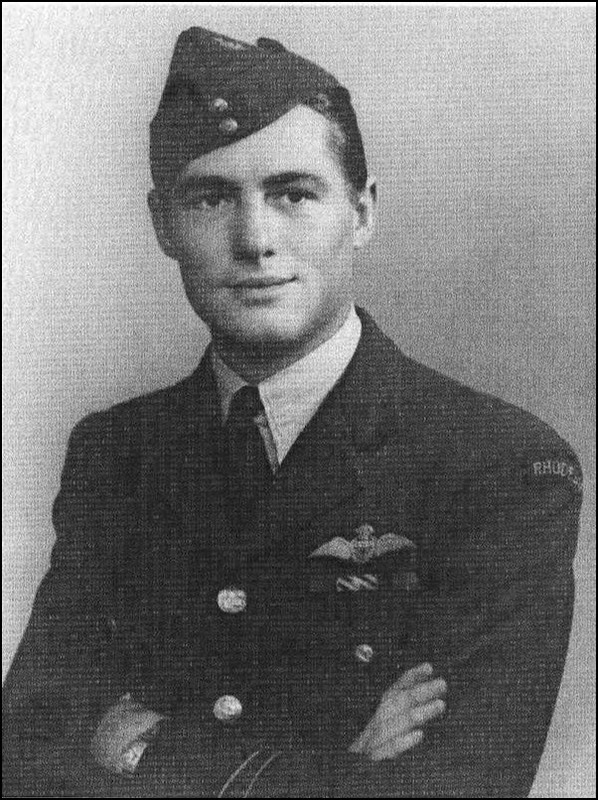 Horsley was awarded the DFC. He began a two-week journey across occupied Belgium and France, travelling by foot, bicycle, train and car. He and his crew were assisted by the Belgian Comet line, an organisation established by the 24-year-old Red Cross volunteer, Andrée ‘Dédée’ de Jongh. He had a narrow escape when he hid in a wood in Belgium one night while awaiting his next move. The wood consisted mainly of poplars, but there was one oak, which he managed to climb using skills honed as a boy scout. A German search party came through the wood, but did not spot him. In all, Horsley was directly assisted by 13 members of the Comet line. Of those, three subsequently died in concentration camps, four survived incarceration, two were shot by the Gestapo and four survived arrest and interrogation. The Comet line assisted a total of 770 Allied aircrew, of which Horsley was the 18th. On reaching Gibraltar with the help of the British embassy in Madrid, Horsley made his way by ship to Scotland. He was asked by an MI9 officer based in Gibraltar to keep an eye on a ‘Belgian priest’ who was travelling on the same ship as to Glasgow. The priest was known to be a German agent and MI9 was anxious that other escapees did not tell him about the Comet line; they also wanted to see who he contacted in Britain. Six months later, the Belgian and 20 of his contacts were arrested by MI5. Robert Milham Horsley was born in 1921 at Poppleton near York, the youngest of four brothers, to Edgar and Irene Horsley. The family owned a wool merchants in York, two large farms and a holiday home at Whitley Bay. The siblings enjoyed a happy childhood. Horsley’s eldest brother, John, joined the army and lost a leg in a bombing in Palestine. The next eldest, Hugh, was killed when his bomber crashed shortly after take-off on its way to a sortie over Germany – an accident that Horsley saw from the cockpit of his own Lancaster as he came into land. The third brother, Osborn, also joined the army. After attending Haughton School in York, Horsley enlisted in the RAF and trained as a wireless operator and gunner before joining 50 Squadron, which was equipped with the twin-engine Hampden bomber, at Skellingthorpe in August 1941. He flew numerous bombing and mining operations before moving on to the Manchester. Horsley married Betty Holtom in 1945; she was a member of the Women’s Auxilliary Air Force and survives him. They had two children, but divorced in 1974. Nigel is a retired journalist and PR professional; Erica is a retired air hostess. Horsley married, secondly, Ludmilla Shenkarenko, the Russian daughter of an adviser to King Abdulaziz of Saudi Arabia. She also survives him. Seven weeks after taking off from Skellingthorpe, Horsley was back in Britain. He retrained as a pilot in Canada and then joined 617 (Dambusters) Squadron, completing 23 sorties towards the end of the war. These included the bombing of the German pocket battleship Lützow in April 1945, raids on U-Boat pens near Bremen and the attack by 359 Lancasters on Hitler’s Eagle’s Nest retreat at Berchtesgaden. In 1955, Horsley was contacted by Rudolf Ritscher, a sailor on board Lützow and the two compared notes on the raid. In a letter to his German counterpart, Horsley revealed that he had held his Lancaster on course as he prepared to drop a 12,000lb “Tallboy” bomb on the ship even though the aircraft’s canopy had been destroyed by anti-aircraft fire. “The cockpit was very drafty without its top, which you had blown off,” he told Ritscher. 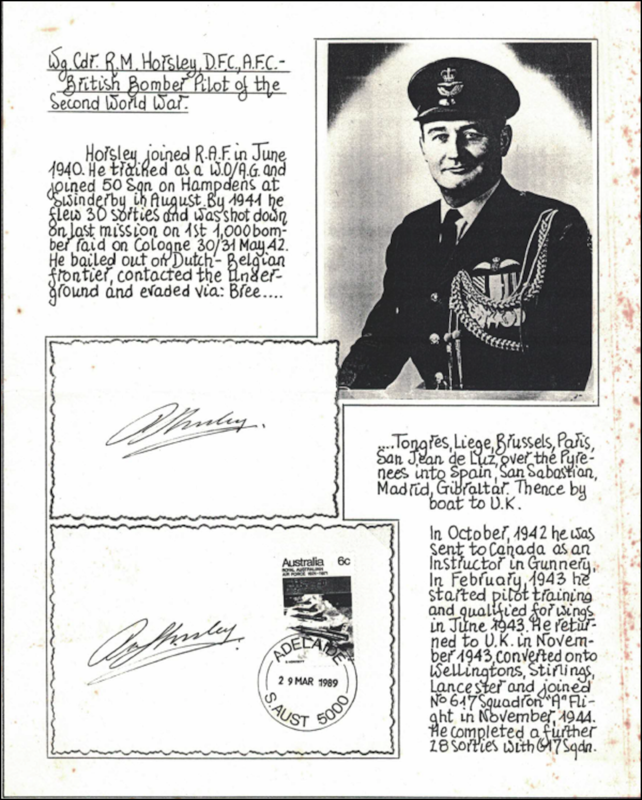 After the war, Horsley was granted a full-time commission by the RAF. He went on to command a jet training squadron and an aircraft maintenance unit. After serving in the Air Ministry, Horsley was appointed air attaché in Baghdad in 1969 and then held the same position in Jeddah. He retired as a wing commander in 1970 and worked as an intelligence officer for the Foreign Office in Beirut. He and Ludmilla had to leave the Lebanese capital four years later with just 12 hours’ notice when he was informed that Soviet agents were on his trail. Horsley is believed to have wrecked a Soviet arms deal. His children remembered his years in intelligence in the Middle East as a time of excitement. In Saudi Arabia, the king and other royals would be frequent visitors, taking advantage of the Horsley drinks cabinet, while in Baghdad he would often take the children on “sight-seeing” trips around military installations. Many of the ‘family photographs’ from those years have the children visible only on the margins. He had a wristwatch that housed a microphone and a cigarette packet that worked as a tape recorder and, like James Bond, he had an eye for the ladies too. Horsley left Lebanon on the first available ship with one suitcase in his hand. He arrived in Italy, having been de-briefed by British intelligence officers on the boat. Three months later, he ‘vanished’ to Tasmania, where British officials had organised a job for him running a golf club near Devonport. Several years after Horsley settled there, Soviet agents were seen in the area; they were deported. In his final role before retirement, he became an estate agent in Sydney. Later, Horsley moved with Ludmilla to Tamborine in Queensland, where he converted a barren patch of earth behind his new house into a stunning garden that he called “Happy Valley”. He loved painting and classical music and enjoyed building dolls houses for his grandchildren. He was for many years an enthusiastic member of the Royal Air Forces Escaping Society and latterly became the president of its branch in Australia.